Smart speakers are quickly becoming standard across U.S. households. My grandmother recently floored me when she demonstrated how she uses her JBL Link to play 60s music with Google Assistant. I was impressed because she was still learning how to Google, but here she was jamming out while making breakfast. That’s the moment I knew smart speakers were here to stay. Research from Nielsen now confirms the sudden rise of this market category. The results of a consumer study were released on September 27 and show that 24 percent of U.S. households have at least one smart speaker. Of those, 40 percent have multiple devices. Usage of these products unsurprisingly is dominated by music, followed by searching for real-time data such as information on weather, traffic, and sports scores. 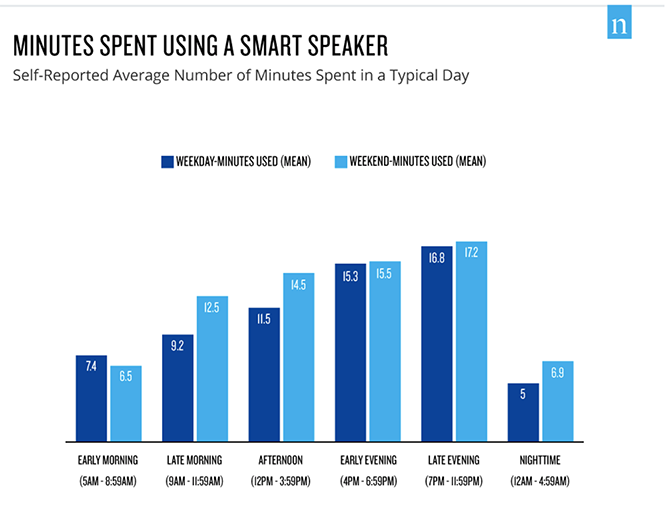 Consumers spend an average of 65 minutes per week day and 72 minutes per weekend day using smart speakers. As manufacturers continue to refine and update the capabilities of their products, sales and usage will continue to rise. Recently, Samsung announced the Galaxy Hub, Amazon revealed a new line of Echo devices, and even Bose signaled its entrance to the market with some Alexa-capable devices. Adobe recently polled consumers and found that nearly half of people who already own smart speakers plan to buy another one for their own use. With names like Hub, and HomePod, it’s evident that these speakers are designed to be the central point of information for households.